Moore County Citizens' Pet Responsibility Committee – PRC – Provide and drive solutions to the pet overpopulation crisis in Moore County. The Mission of the Moore County Citizens’ Pet Responsibility Committee (MCPRC) is to provide and drive, with the support of the Moore County Commissioners, solutions to the pet overpopulation crisis in Moore County. The MCPRC Pet Responsibility Program is presented as an integral part of Moore County Schools’ Character Education Program and focuses on good judgment, integrity, kindness, perseverance, respect and responsibility. It is also continually updated to reflect volunteer input and support state standards. The MCPRC reports into The Moore County Sheriff’s Office and involves Animal Services Deputies in its education efforts. The MCPRC leverages a diverse volunteer base with volunteers presenting a carefully constructed program to fourth graders annually, once a week, for a period of six weeks. 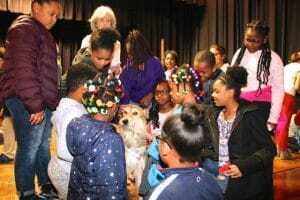 The MCPRC pilot launched in 2008 with the goal of sharing the Pet Responsibility Program with over 1,000 fourth grade students in Moore County each year. Today, the program is an integral part of the curriculum and taught annually in all Moore County public schools and five major private and charter schools. It reaches over 1,200 students annually. 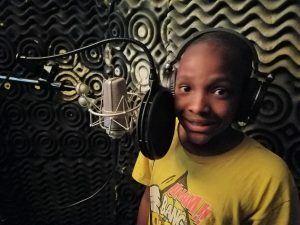 Marquis Wiltshire, from Southern Pines Elementary, recording his rap song, “Love Your Dog”, which he wrote in 2017 after being in the Pet Responsibility Program. Click here to see the Youtube video. We are happy to offer our lesson plans to others who would like to begin this program in their area. Teachers, helpers, therapy dog teams, mascots and photographers needed! Please contact us today to learn more about our program and sign up today! Click here for contact information. To volunteer at The Animal Center of Moore County (Moore County Sheriff’s Office Animal Shelter) please contact The Animal Center at 910-947-2858. 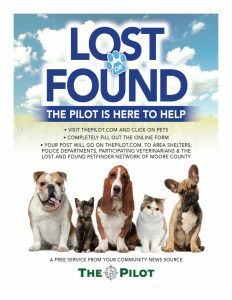 Help reunite Moore County pets with their owners – spread the word! We are asking for your help to let people know about a free service in Moore County. Please tell, email, post Instagram everyone you know and share the flyer to the right. Feel free to print and post the flyer too. We hope to reunite every pet with their owner and increase awareness of this service to achieve this.